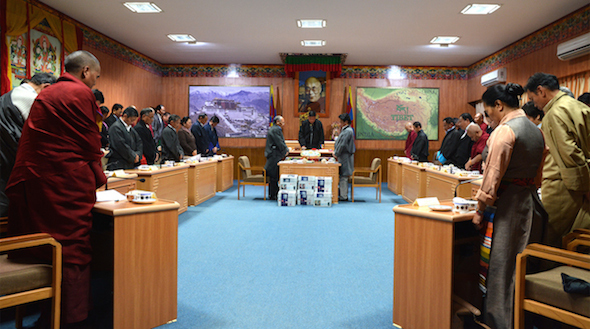 (TibetanReview.net, Mar22’16) – A day after exile Tibetans living in the free world went to poll for their general election, the 15th Tibetan Parliament-in-Exile began its final, usually biannual, session on Mar 21, with the main agenda of debating and adopting the annual 2016-17 budget of the Central Tibetan Administration, Dharamshala. On its opening day, the parliament adopted motions to mourn for the passing away recently of Taklung Tsetrul Rinpoche, the head of the Nyingma school of Tibetan Buddhism; Mr Karma Chophel, MP; and Kalsang Wangdu and Dorjee Tsering who both died after carrying out protest self-immolations in Tibet and India respectively. The current session of the parliament, the 11th, will conclude on Apr 1.